and it supports them all. 1:13 He chose three letters from the singles, which are the secret of the three mothers, Aleph, Mem, Shin, and He put them in His great name, and He sealed with them the Six Extremes. Five He sealed High, and He looked up, and sealed it with the letters Yod, Hey, Vav. As a group, Sefirot four through nine are known as "The Six Extremes" (Shesh HaKetzavot). And they've been contradicting themselves ever since. The basic problem is the incompatiblity of two geometric models: the 4-6 3-D geometry of the Cube of Space of the Sepher Yetsira, and the 3-7 2-D geometry of the Tree of Life of later Kabbalah. The collision of these models resulted in a confusion between the seventh double letter Tav and its "hidden" direction in the center of the six extremities, and the seventh sephira of the Tree of Life. As early Kabbalah synthesized contradictory sources, the location of the center, the Holy Temple in the center of the Cube of Space of the Sepher Yetsira, and not one of the sephirot 5 through 10, was lost. The primary areas of contention between the two systems -- the order of the directions, the beginning of the Six Extremes, the formative status of the 10th Sephira, the location of the Holy Palace -- were resolved by the Zoharic integrators in two ways: re-writing the Sefer Yetzira to accord with the cosmology of the Zohar (changes in formative letter and planetary structure) and re-mapping the directions and planetary sephirot on the Tree of Life and replacing the linked semantic categories of the Sepher Yetsira with the anthropomorphic imagery of the Partzuf. The effect was to replace a cosmological/cosmogonic system with a mythological/theosophical one and the end result was to disconnect the 10th Sephira, North, from the six directions of outer creation and apparently sever the connection of Shekinah with the material world. The Sepher Yetsira names the Sephirot Belimah as the numbers one through ten: Ten: He sealed "north". They are divided into the first four, non-spatial directions (Begin, End, Good, Bad) specified by permutations of their qualities (Thirty-Two Paths) and elemental interactions (air, water, fire) and the last six, spatial directions (up, down, front, back, left, right) specified by seal, formative letter, planet and contrary quality. The first four sephirot form Adam Qadmon's inner, intemporal, space and the last six his outer, developmental or experiential, space. All are symbolic, abstract spheres of structuration beyond space-time, except for the last. All versions of the Sepher Yetsira, even the Zohar-compliant redactions, specify the outer directions as the Sephirot 5-10 and either South or North as the 10th Sephirot. 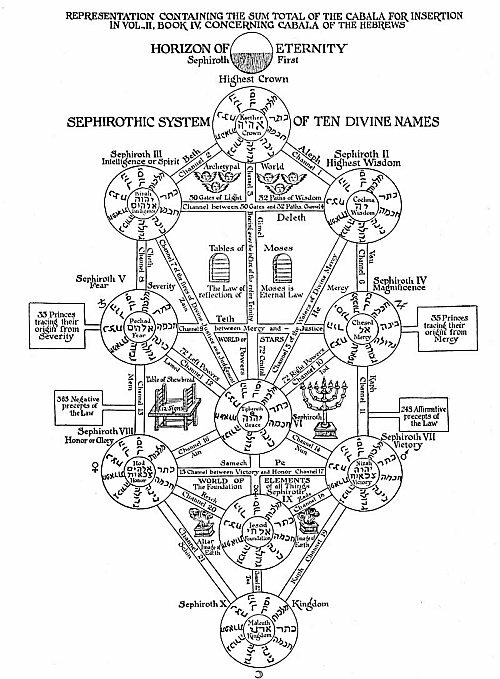 Most later Kabbalah, including hermetic derivatives, migrates the six extremities upward in the Tree of Life, favoring a 3 + 7 or 3 + 6 + 1 division, leaving the 10th sephirot without a formative letter and planet and often transmuted into an "element" called earth, unknown to the Sepher Yetsira. It was the Kabblists themselves who preserved the correct text, initially concealing it from outsiders. Around 1550, Rabbi Moshe Cordevero, leader of the Safed school and the greatest Kabbalist of the day, sifted through the ten best manuscripts available, choosing the one most closely fitting the tradtion of the Kabbalists. A generation later, the text was further refined by the Ari (Rabbi Yitzchak Luria), one of the greatest Kabbalists of all times. This text, known as the Ari Version, was published a number of times, usually as part of some other collection. It resembles the Short Version in many ways, but there are some very significant differences in assignment. In general, the Ari Version is the only one which is in agreement with the Zohar. A number of variations were found even in this version, and a final edited text was finally produced by the Gra (Rabbi Eliahu, Gaon of Vilna) in the 18th century. This is known as the Gra-Ari Version, or simply, as the Gra Version. In Cube: Sephirot, we raised the question, "What were the names of the sephirot before the Zohar?" and outlined the generalized, formative meanings underlying the elegant but restrictive attributes of the Zohar, with an application to the 5th Sephira, more usefully considered as the Sephira of Life than as the Sephira of Strength. Our goal here is to uncover the original formative meanings and structure of the Ten Sephirot Belimah of the Sefer Yetsira, an ancient text written in a much earlier time and in a very different mode of thought than later Kabbalah, and use that map to find the center of our own psyches. The mode of thought of the Sefer Yetzirah -- essentially experimental and observational -- was lost as it was assimilated and combined with other mystical paradigms by the early kabbalists. The linked semantic categories of the Sepher Yetsira are examples of this mode of thought. In our example, Bayt forms Shabatai Alive in the Universe at the 5th Sephira (of Life) sealed by YHW in Ghedi formed by Ayn. None of these connections are arbitrary; they are embedded in a complex, interrelated, recursive, self-defining semantic (structural/energetic) ecology. Within this ecology, it is impossible to arbitrarily move signifiers and expect to have living meaning. The Sefer Yetzira appears to base its statements and conclusions on observation and analysis, rather than on homiletical interpretation of biblical verses and the traditions of ancients sages. Its statements are ones that can be analysed, criticized, and interpreted on their own merits, rather than in comparison to a proof-text or the truth revealed to previous generations of sages. The basic concepts of the Sefer Yetzira are so radically different than those of ancient Judaism that the attraction they exerted on Jewish Medieval scientists is obvious, once we successfully detach ourselves from the images introduced by eight centuries of "mythical," "mystical, and "magical" exegesis on the book. The consequences of the reduction of a multi-dimensional model (the Cube of Space) to a 2-dimensional model (the Tree of Life) by medieval minds who had not yet achieved Renaissance perspective and for whom representational space was two-dimensional and flat, is little appreciated. The fracture lines of the collision of these two models -- noted above -- are just below the surface in the primary and secondary sources and remain unanalyzed and unresolved. Scholem seems unaware that something is missing or that his numbers don't add up. We can see the outline of both systems -- the 3/7 of the 2-D Tree and and the 4/6 of the 3-D Cube -- in his section headings (the repressed returns) but only an acknowledgement of 5/5 and 3/7 divisions in his text. This leaves the mystery of how the "six were complemented by a seventh," which is why the greatest scholar of Jewish Mysticism doesn't know where to put the Fourth Sephirot or find the center that "supports them all." In the Sefer ha-Bahir, and in several early texts of the 13th century, the Sefirah Yesod was thought of as the seventh, preceding Nezah and Hod, and only in Gerona was it finally assigned to the ninth place. The division of the Sefirot was also determined by other criteria. Sometimes they were divided five and five, i.e. the five upper Sefirot corresponding to the five lower, an equal balance between the hidden and the revealed being maintained. On the basis of the state in the Pirkei de-R. Eliezer "with ten sayings was the world created, and they were summarized in three," they were also divided in seven and three. In this case there was a differentiation between three hidden Sefirot and "the seven Sefirot of building," which are also the seven primordial days of creation. Six of these were also equated with the six sides of space in the Sefer Yezirah. How these six were complemented by a seventh was never decisively established. Some thought of the seventh as the sacred palace which stood in the center, as in the Sefer Yezirah. Others considered it to be represented by Divine Thought, while for others it was a symbolic Sabbath. The correlation of the "Sefirot of building" with the days of creation became extremely complex. Many kabbalists, including the author of the bulk of the Zohar, could not agree on the automatic association of each Sifirah with one particular day, and they regared creation, which from the mystical viewpoint was the completion of "the building" of emanation, as having been already completed by the fourth day. They were particularly perplexed by the problem of the Sabbath, which many interpreted as a symbol of Yesod, since it paralleled the original seventh place of the Sefirah, while many others saw in it an allusion to the last Sifirah, expecially since the powers came to an end there. "Some thought of the seventh as the sacred palace which stood in the center, as in the Sefer Yezirah. Others considered it to be represented by Divine Thought, while for others it was a symbolic Sabbath." It is all these things according to the Sepher Yetsira: the Holy Sanctuary, the center or kernel which carries them all, the Divine Thought of the first sephira of the Bahir, Aleph, and the seventh day, Shabat, formed by the seventh double letter, Tav. SY IV:11 Bestowed (the) kingship on Aut (Tav) and bound (a) crown to it and created it with Lavanah (Moon) in the universe and Yom Shabat Beschinah (in the transformation) and Pay (mouth) Benefesch (in the individual). And it is also the center of our own psyches, recognizable in the Moon which Tav, the seventh day and last letter and first/fourth sephirot, forms in the universe. The Book Bahir, the root document of medieval kabbalah, compiled and composed nearly 1000 years after the Sefer Yetsira (taking a third century date for the Yetsira), contains, with Rabbi Eleazar of Worms' Sefer ha-Hokhmah., the first mention of the ten sefirot as aeons or divine hypostases in an emanative Tree of Life. The Bahir, blending the cosmology of the Sepher Yetsira with other early paradigms, such as the theosophical speculation of the Shi'ur Qomah and the Hekhalot mysticism of Raza Rabba, was a bridge to the attributive sephirotic descriptions and anthropomorphic theosophical speculation of the Zohar and later kabbalah. This also marked a shift from the rational/experimental mode of thought of the Sepher Yetsira to the mystical and homiletical/exegetical mode of thought crystallized in the Zohar and intensified in the work of later kabbalists. ...We must pose the question of the origin of the other designations of the first sefirah ... Mention is made of the thinking or the thought of God, makhshabah, as the most hidden sphere, but also as the center of the innermost of the first six logoi. The Bahir knows the first, most hidden, sephirot, as Makhshabah and Keter 'Elyion, which are identified with the Holy Temple, which in the Sepher Yetsira is formed by the seventh double letter Tav in the center of the Cube of Space. The search for "the innermost of the six logoi" is much easier in three dimensions. This is a clear example of the stamp of the cosmology of the Sepher Yetsira on the Book Bahir, an understanding that would be lost to later Kabbalah. Whereas the ten sefiroth are often spoken of as a unity, particularly in the parables, one can nevertheless already clearly recognize in many places a fundamental division into two groups that was to become canonical in the Kabbalah. This division into three higher and seven lower sefiroth goes back to Pirqe Rabbi Eliezer, a late midrash that also contains much older material. In order to use the cosmology of the Sepher Yetsira, our medieval kabbalists would have had to be able to visualize energy flows in 3 dimensions with themselves in the center of a perspectival cube. Instead, they adapted the technology to 2 dimensions and the pre-perspective, pre-relativistic, pre-individual psychological space they were living in. The third logos, one could say, is overdetermined: the symbolism of the Sephia and its treasure house is not so much united as jumbled together with that of the pneuma of God, borrowed from the Yetzirah, and with that of the letters engraved in the air that issues from it. Most, if not all of the major con-fusions in the Bahir have to do with "jumbles" and "juxtapositions" of "different sources." It appears that Sepher Yetsira is the major different source, and its inadequately assimilated structure is still visible in the Bahir. Here we have two motifs that prima facie contradict each other. On the one hand: the water is that of the Torah; on the other, it is that of the good deeds; and the two exegeses are simply juxtaposed. It is evident that such a combination could result from an association of the cosmological symbolism of the Book Yetzirah with the speculations of the Merkabah and the Shi'ur Qomah. The symbolic associations for logoi 4-6 are relatively consistent, while with regard to the last sefiroth, the contradictions are so striking that they can be satisfactorily explained only by assming a juxtapostion of fragments from different sources. Our thesis is that the Bahir is a redaction of partly contradictory sources in confirmed no less convincingly by an analysis of the statements concerning God's left and the nature of evil. In section 102, developing a statement concerning 'araboth, heaven is mentioned as the seventh logos, but everything said there fits the sixth rather than the seventh logos. Chagigah 12b: Wilon, Rakia, Shehakim, Zebul, Ma'on, Makon, Araboth. All these uncertainties trace the submerged but unresolved influence of the Sepher Yetsira. Araboth, Aleph-Raysh-Bayt-Waw-Tav, daughter of the light, the highest, seventh, (some say tenth) heaven. The sixth and seventh, or the seventh and the first? The interpolations in sections 106-113, which, in keeping with the kabbalistic symbolism that the redactors had in mind, relate to the third and fifth logoi of this sequence, happen to be placed between two paragraphs dealing with the eighth and seventh logos. "He is called the eighth only with regard to the enumeration; according to his activity, he is the seventh. (section 114). Third and fifth or eighth and seventh? The seventh logos of the Bahir corresponds exactly to the ninth sefirah in the later canonical sequence ... The relation with the celestial temple which represents "Thought" or that which is within "Thought" as expounded in section 103 in one of three variations on the seventh logos of our table (sections 102-104), is completely outside this particular series of motifs, as we saw above in our discussion of the first sefirah. Only the notion of the six dimensions, by means of which the world -- space -- is sealed, is taken over from the Book of Yetzirah ... In the center of this terrestrial world is the Temple of Jerusalem; in the center of the corresponding world of the logoi, the celestial temple. Seven and the center again. In the Cube of Space, the location is obvious; but where to place it on the two-dimensional Tree of Life? We're tried to show two things with this list: that the cosmology of the Sepher Yetsira is at the bottom of many of the sephirotic ambiguities and awkward fits in the Bahir; and that the primary difficulty was with the number seven, which appears sometimes as the seventh sephirot and sometimes as the seventh, inner direction (the Highest Thought) of the Sepher Yetsira, which is not the seventh sephirot in that book. We have seen the outline of the Sepher Yetsira still visible in the Bahir, which Scholem says stands at a crossroads because it looks back to ancient sources that have been permanently lost and forwards to later syntheses like the Zohar and post-Zohar Kabbala. Our thesis is that the center of the Cube of Space, the Holy Temple, was lost in this transition, due to the psychological limitations of living in the Middle Ages. of the Book of Creation; however, that book knows nothing of a relation between the temple and the seventh sefirah. It does, however, know a lot about the relation between the temple and the seventh direction, which Scholem should have known, as the world's leading scholar of Jewish Mysticism. The conclusion to be drawn is that he never assimilated the 3-dimensional geometry and sephirotic structure of the Sepher Yetsira, as we have seen in his blindness to the obvious 4-6 sephirotic division of that book. The sentence stating that the celestial sanctuary is in the center of the world and bears all six directions, which at the same time correspond to the last six defiroth, figures in the fourth chapter of the Book of Creation; however, that book knows nothing of a relation between the temple and the seventh sefirah. This correlation would fit a revision of the ten sefiroth of the Yetzirah in the sense of the doctrine of the Merkabah and the cosmology that corresponds to it. The continuation of the sentence in the Bahir, on the other hand, introduces a new element of mystic-gnostic speculation. Neither Yetzirah nor the Raza Rabba knows anything of the "thinking" or the "thought" of God conceived as an aeon or a sefirah. The Bahir, on the other hand, wavers between two conceptions: the one saw the makhshabah, just like the speculations of the ancient Gnostics on the ennoia, as the highest of all the sefiroth or aeons; the other conflated it, as here, with the seventh, which remains rather enigmatic. In other passages of the Bahir, in sections 48 and 84, it is the Holy Temple of the Celestial Jerusalem that is conceived as the symbol of the highest sefirah, represented by the letter 'alef as the beginning of all letters. The logic of the Yetzirah passage, which served as the point of departure, would suggest, in fact, the seventh place in its system of enumeration; the logic of the mystical symbolism of the ennoia, which was apparently introduced from another source, points to the first. One can clearly see that two motifs of different origin are contending with each other here and that the Book Bahir adopted both traditions. The two motifs -- Aleph/ennoia and seventh/holy palace have, in fact, the same origin: the Sepher Yetsira. Their relationship is both revealed and confused in the Bahir. But are we reading the same book? 1:13 Seven: sealed the East, turned towards his (own) face and sealed it with Hay-Yod-Waw. The logic of the Sepher Yetsira does not suggest the seventh sephira for the location of the Holy Temple. In fact, it dictates that it not be one of the Sephirot 5 through 10. This is a prime example of the confusion of the seventh double letter and the seventh sephirot in the minds of both kabbalists and their esteemed scholars. All the scholars quoted below are trying to draw a distinction based on the wrong difference. The difference they see is between the Sephirot of the Sepher Yetsira and the Sephirot of later emanative Kabbalah with its complex attributive theosophy. Without access to the true source of the difference -- the linked semantic categories of formation of the Book Yetsira -- they only see the Sephirot of the Yetsira as "metaphysical principles" or "mythical and dynamic numbers" and consider it "implausible" that they might refer ("equate") to the same Sephirot as the Zohar. Part of the justification for this view is the division of 10 sephirot and 22 autiot, as if they were either pure numbers or letters and thus separate "cosmological/cosmogonic functions" to use Scholem's term. The alternative to this artifical distinction is to enter the mode of thought of the Sepher Yetsira, in which the functions are fused in the letter-numbers of the Hebrew autiot and the linked structural/semantic categories which describe and qualify the "numerical" Sephirot. The Sepher Yetsira, the first Hebrew writing to refer to the sephirot, names them by number and describes their cosmological/cosmogonic funtion. The fact that attributive descriptions are not given is often interpreted to be a sign that the sephirot of the Sepher Yetsira are considered only as "metaphysical principles or stages of the creation of the world" (Gershom Scholem, Kabbalah, Keter, 1994, p.23) or only in a numerical or semiotic and non-semantic sense (J. Dan, Jewish Mysticism, Vol 1, p.151). The ten Sefirot in the Book of Formation were originally understood as mythical and dynamic numbers emerging out of God and returning to Him, and, together with Hebrew's twenty-two letters, instrumental in the Creation of the world. While an affinity between the Sefirot and the Deity can be seen in this ancient source, it would be implausible to assume an equation between these numbers and Divine Manifestations. Yet in the earlier Jewish and Jewish-influenced sources, the decad played and important role in the Creation of the world and in the Divine Manifestation. Indeed, ten creative speeches, ma'amarot, were detected by rabbinic masters in the first chapter of Genesis, and ten spiritual entities where were instrumental in the Creation of the world have been enumerated in the Talmud. Whether the aeons or logoi of the Bahir were created by God or rather emanated from him remains unclear, at least for the greater part of the Bahir. Perhaps the authors never asked themselves questions of this kind. Another way to chart the collision of systems is follow the assignment of the Yetsiratic directions to the Sephirot of the Zohar by early and late post-Zohar Kabbalists. Apart from Luria's syncretism and dualism, and the obvious variety of authoritative opinions, we're left wondering why the simple solution is so unpopular. The Seals of the outer directions in the Sepher Yetsira can similarly be followed in different versions of the Sepher Yetsira and later Kabbalah sources. All versions before the Gra Sepher Yetsira specify the great Name: YHW. He selected three letters from among the Elementals and fixed them in His great name: YHV. Long Version 1:14. By the 18th century, the progress toward arbitrary formalism did not want to call attention to the Name itself. Sealed with His great Name: Yod-Hay-Waw. Three axes, three letters. The Vav scheme does not recognize that the axes/flows are one-way, each characterized by a different leading energy and a different aspect of the Name and integrated with the sephirotic number, formative letter and planetary binomial, etc. Returning to the question of how the location of the center of the Cube of Space was lost in the translation to the geometry of the Tree of Life, a view of the contending systems of planetary assignments shows considerable variety in the registrations of the Zoharic sephirot with the directions and planets of the Sepher Yetsira. Having confused the seventh direction with the seventh sephira, both the location and planetary identity of the center of Cube was lost. No one between the 10th and late 20th centuries put the Moon, representative of the human psyche, in the location of seventh, "hidden" direction, the kernel "which supports them all." Hence Kaplan's confusion: "The Holy Palace. This is usually interpreted to denote Malkhut," where "usually" means Kabbalistic thought after the 17th century. See: Planetary Attributions for sources. There are some differences among the early (Saadia, Short, Long) versions of the Sepher Yetsira, but they do all agree on what Hebrew letters forms what planetary energy, numbering the planets in their classical geocentric order and matching them with the seven Hebrew double letters in order. No one seems to recognize Zoharic "astrology" for the aberration it represents (changing the classical order of the celestial spheres and their correspondence to the seven double Hebrew letters in order, changing the planetary formative letters, etc). "The differences of reading between the three recensions are not as many as is generally assumed" (Ithamar Gruenwald, "A Preliminary Critical Edition of Sepher Yetzirah" in Israel Oriental Studies 1 (1971): 133). The letter of the alphabet is the source of the planet, and not a sign by which it is designated. The linked categories and interrelated semantic systems that are the basis for the astrological formative language of the Sepher Yetsira -- Sephirot, Hebrew formative, seal, direction, planet, contrary qualities -- were replaced with a system based on color correspondences from the Zohar which essentially discarded (or ignored) classical cosmology. When the Sefirot and days arc placed in their usual order, the planets appear in the order given in our version of the Sefer Yetzirah. This version therefore is that which fits most closely to the teachings of the Zohar. The Moon in the physical world represents Kindness; therefore it is white, since white is Kindness. This [the Mishnah] is in the same order as their creation, as is stated in the Tikunei HaZohar "White is associated with the moon, red with Mars, yellow-green with the Sun, black with Saturn, and blue with Jupiter." These are the colors of Chesed (Kindness), Gevurah (Courage), Tiferet (Beauty), Yisod (Foundation), and Malkut (Kingdom). Netzach Eternity) and Hod (Beauty) are associated with Venus and Mercury. The Gaon is following the usual order found in the Zohar. The first of the seven lower Sefirot is Chesed (Kindness). Associating it with the moon is sensible, as it is white. White generally symbolizes kindness in Kabbalah ... The Gaon's text seems to fit better than that of the standard version, although one cannot be sure what was in the original Sefer Yetzirah. This Sphere (Kether) is called RoaASH HaLaVaN (the While Head). Fortunate is the one who understands this truth, for then he will understand the essence of LaVaN and LaVaNaH, the beginning and the end. The earliest theosophical perceptions of the Sefirot occur concomitantly in Provencal Kabbalah, in Sefir ha-Bahir, and in the estoeric materials preserved in R. Eleazar of Worms's Sefer ha-Hokhmah. The incredible explosion of Jewish mystical thought that began in the late 12th century with the publication of the Bahir and continued into the 18th century is seldom recognized (outside of scholarly circles) for its uniqueness, power and impact on history. Medieval Kabbalah took several hundred years to integrate its various mystical roots -- Bereshit, Merkavah, Hekhalot, Shi'ir Qomah, Names of God, Shi'ar ha-Shaireem, Sefer Yetzirah -- as well as supposed Neo-Platonic and gnostic influences -- into the synthesis of post-Zohar and Lurianic Kabbalah. In this process the many differing points of view of early Kabbalah were reconciled into canonical structures which often contradicted or ignored earlier formulations. The emergence of a new kind of mystical thought occurs only during three major periods in Jewish history. Together with the Sefedian phase of Kabbalah, approximately 1540-80, and the Hasidic, 1740-1800, the late thirteenth century Kabbalist writings laid the foundation for most of the major Jewish mystic paradigms. Before early Kabbalah, classical Judaism limited God's attributes to only a few -- loving kindness, stern judgment, Shekinah (which is not feminine and identical with Presence or Kavod). The new paradigm of the Kabbalists was emanation, which extended God into his Creation. Scholem's description of the history of the kabblah details this linear development from its beginnings, postulated that it originated as a single source, namely the Bahir, and that the kabbalists of the Provence, especially Rabbi Isaac the Blind, based their symbolism and mystical speculations on the Bahir. For Scholem, therefore, the questions of the orgins of the Bahir became one and the same, because in his presentation there was no other source to the symbolism of the kabblah but that found in the Bahir. This linear structure, starting immediately in the beginning of medieval Jewish mysticism, seems to need drastic reevaluation. While the later development of Jewish mysticism is indeed surprisingly linear, the very beginning was probably multifacted and relied multiple parallel developments, which today can be summarized by the statement that the old, simple concept of the unity of God was broken in the few decades between 1180 and 1210 probably six time, by independent schools of thinkers in central and southern Europe. It is even probable that the Bahir and Rabbi Isaac the Blind developed independently the concepts of the ten sefirot. After our preceding analysis of the sources, we may now pose the question regarding the ideas about the ten powers of God as they had crystallized in the oldest form of the Kabbalah accessible to us. The schema of the sefiroth is still in flux, at least in regard to several of the powers and their position in the whole. It is precisely its unfinished state that enables us to distinguish more clearly certain stages in the development of the schema, which was to be appropriated by the Kabblah, and to discern the greatly variegated motifs that led to its formation. Whereas the ten sefiroth are often spoken of as a unity, particularly in the parables, one can nevertheless already clearly recognize in many places a fundamental division into two groups that was to become canonical in the Kabblah. This division into three higher and seven lower sefiroth goes mack to Pirque Rabbi Eliezer, a late midrash that also contains much older material. In chapter 3 we read: "Some say: By means of ten sayings, ma'amoroth, the world was created, and they were united in three [attributes]." These three supreme middoth, deduced from Proverbs 3:19, 20, are Wisdom, Understanding, and Knowledge, which are mentioned together in several verses of the Bible [Exodus 31:3, 1 Kings 7:14, Proverbs 24:3]. Yet precisely these verses are not mentioned in the Bahir; and in fact only once, in passing as it were (section 129) does da'ath, "knowledge" or gnosis, appear as the name of an aeon. Instead we find in sections 89 and 96, not as the third but as the highest of all the logoi, an entirely different image: that of the supreme crown, kether 'elyon. "Wisdom" and "Understanding" are named in section 32 as the second and third groups of logoi, whereas the highest, the third, which is above the two others, is designated as the wondrous and the impenetrable.